Check out our "Pit Blog" below. 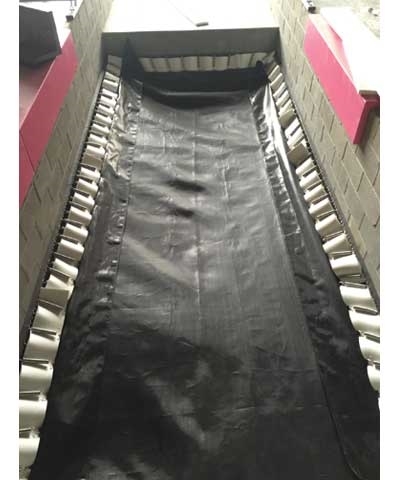 The By GMR Custom Pit Tramp Sag Bed™ System is state of the art. Our bed frames are installed at a 24" to 36" depth depending on the size of the pit. 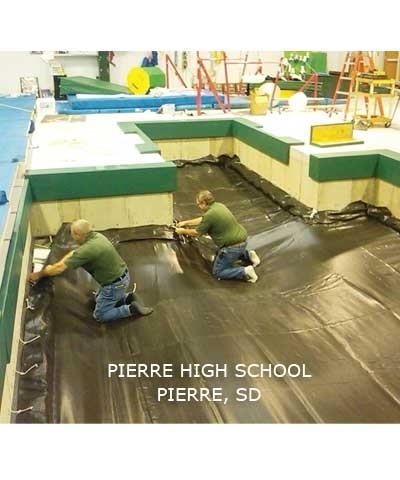 7.5' to 12' wide pits can be installed at 36" depth and larger square or rectangular pits at 24" depth. The pit beds are intentionally designed to be be loose and sag towards the middle of the pit bed. Even though the frame is installed at a 24" to 36" depth, the "Bed Sag" adds up to an additional 6" to 18" of depth. 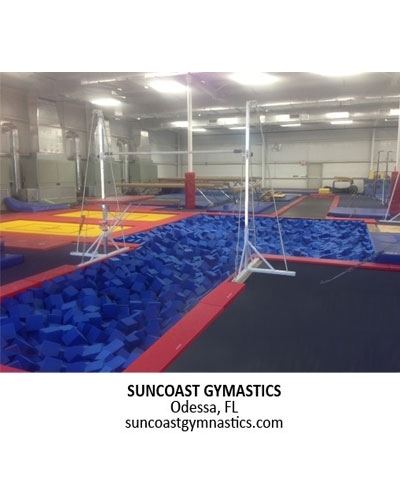 World Class Gymnastics in Jacksonville, FL (see main picture) is a perfect example of an 18" bed sag. The World Class pit is 17'x24' with the frame installed 24" down and a bed sags to approximately 42" or 3.5'. 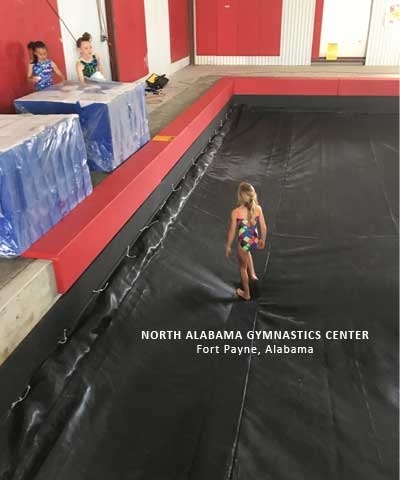 Combining this with our pit cube "Overfill Factor", the bed will compress or stretch ever further after adding the pit cubes and the weight of the gymnast. The By GMR Pit Bed System is less likely to pack down and is easier to fluff because there are less pit cubes which creates a more lively Pit Bed. This system allows for better deceleration without the sudden tramp jolt as on other systems. The Overfill Factor will help insure that there is no "air void" until contacting the pit cubes, like on other systems. The By GMR Pit Bed includes"
Heavy Duty Poly Pit Bed with extra long spring skirt and skirt tie downs. 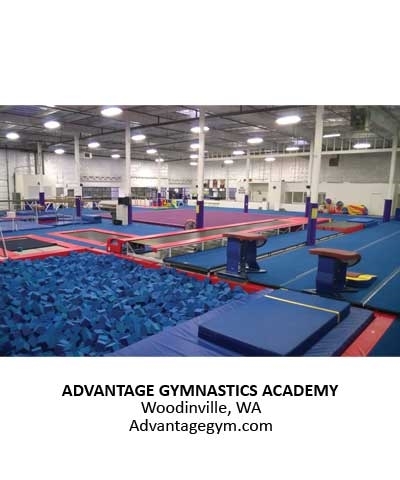 GYMNASTICS PRACTICE: IT'S THE PITS! ABOVE GROUND AIN'T THE PITS! Recommended concrete pit specs, but ALWAYS CHECK YOUR LOCAL BUILDING CODES. Concrete slab on grade with gravel base. 4” monolithic slab with 6”x6” wire mesh and standard 12” footings. 8” poured concrete walls with #4 rebar installed 12” on center, vertical and horizontal with #4 dowel tie-ins to existing slab. Any activity involving motion or height creates the possibility of catastrophic injury, paralysis or even death, from landing or falling on the neck, head or other parts of the body. Pits with pit tramp beds are intended for use ONLY by properly trained and qualified participants under supervised conditions. Use without supervision or abuse, could be DANGEROUS and should NOT be undertaken or permitted. Before using, KNOW YOUR OWN LIMITATIONS and the limitations of this equipment. If in doubt always consult your instructor. Always inspect for worn, defective or missing parts and test stability before each use. HEAD FIRST ENTRIES SHOULD BE AVOIDED AT ALL COST. 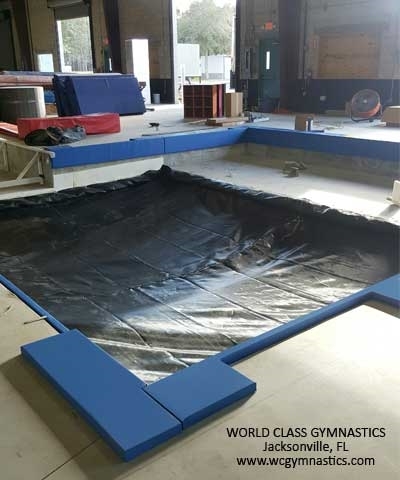 THE CURRENT STATE OF THE ART IN LOOSE FOAM TRAINING PITS DOES NOT PRECLUDE THE POSSIBILITY OF SERIOUS, CATASTROPHIC INJURY OR EVEN DEATH. 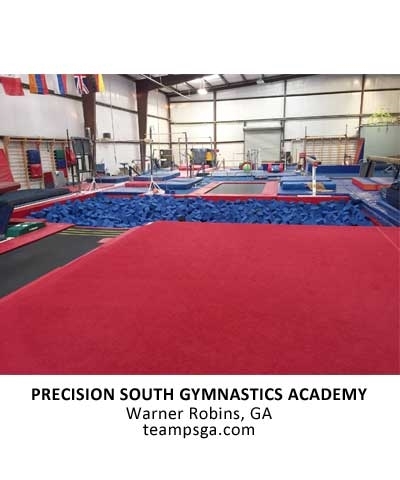 Use the pit only under direct supervision of a competent gymnastics professional. Do not wear any jewelry, attachments on clothing or items in the hair. These objects may come loose in the pit and cause eye injuries, puncture wounds, etc. Always make sure that the foam has been adequately fluffed before using the pit. 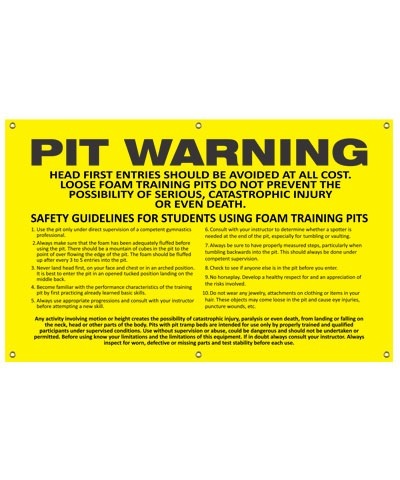 The foam should be fluffed up after every 3-5 entries into the pit. Check to see if anyone else is in the pit before you enter. 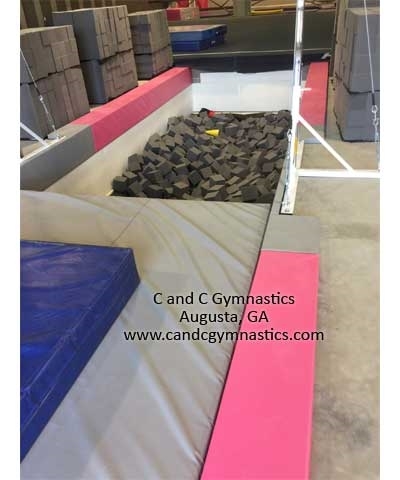 Become familiar with the performance characteristics of the training pit by first practicing already learned basic skills. Never land head first, on your face and chest or in an arched position. It is best to enter the pit in an opened tucked position landing on the middle back. Always use appropriate progressions and consult with your instructor before attempting a new skill. 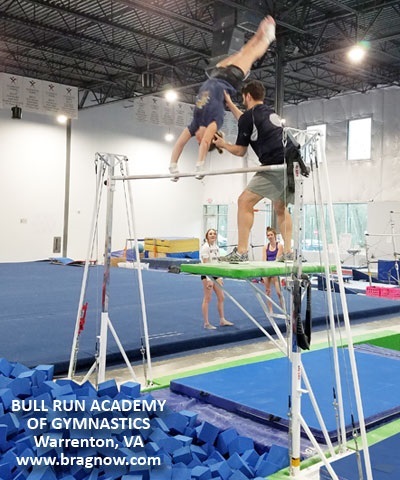 Especially for tumbling or vaulting, consult with your instructor to determine whether a spotter is needed at the end of the pit. Always be sure to have properly measured steps, particularly when tumbling backwards into the pit. This should always be done under competent supervision. No horseplay. Develop a healthy respect for and an appreciation of the risks involved.